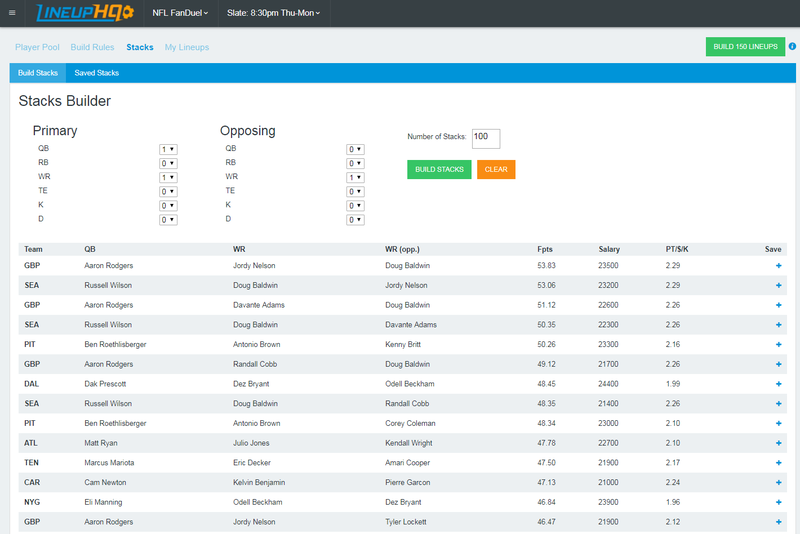 Now you'll be able to build lineups while seeing advanced stats from great resources like Football Outsiders and Player Profiler, while also getting expert insight from the likes of Notorious, stlcardinals84, meansy53, and JMToWin. 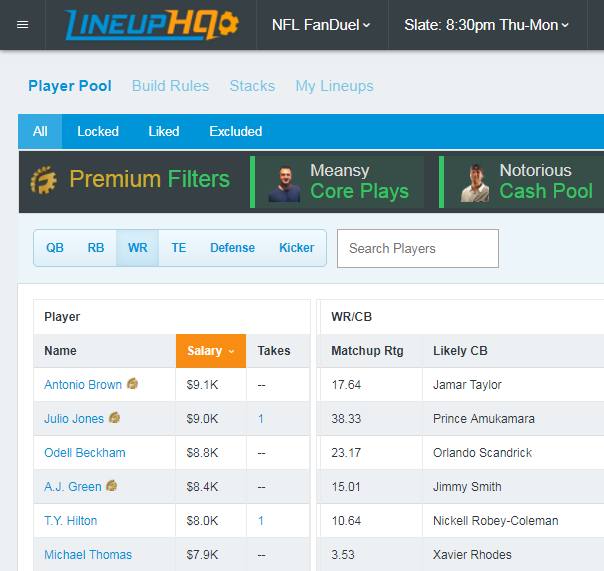 Let's go through some of the great features of LineupHQ and build some winning lineups! When you load up "LineupHQ":https://rotogrinders.com/lineuphq, you'll see a single lineup optimizer on the right hand side of the screen. 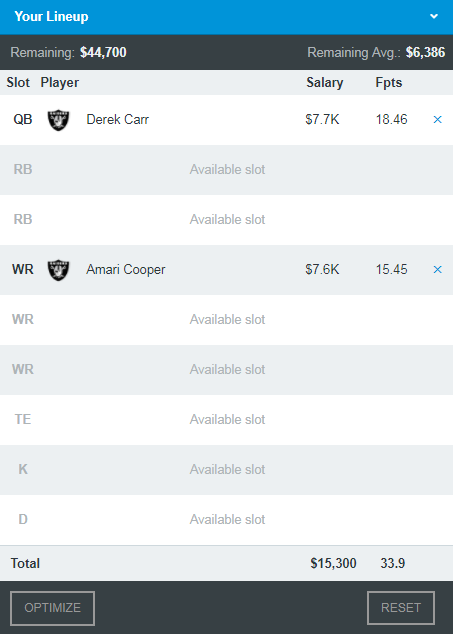 Click the OPTIMIZE button and you'll get the optimal projected lineup (the default is RotoGrinders projections) for that Raiders stack. If you are a RotoGrinders Premium member you'll be able to access the Premium Filters. 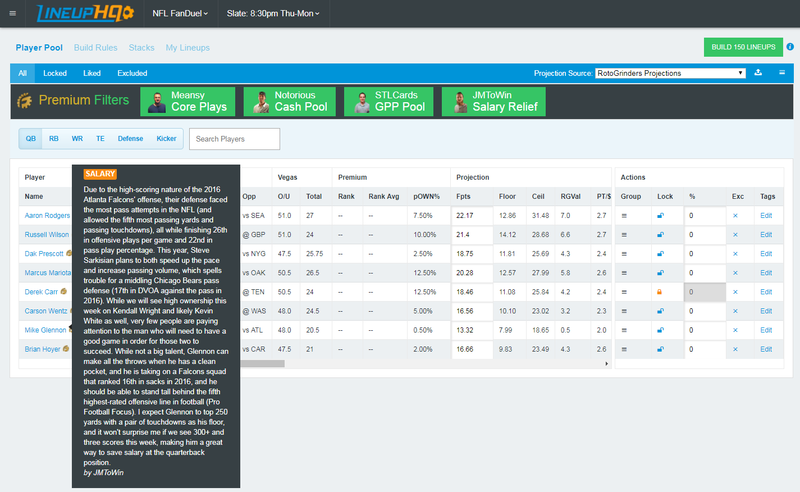 At the top of your LineupHQ page, you'll see a Premium Filters section that will allow you to filter out players based on what type of play you are looking for using some of the best DFS minds in the industry. Want to know meansy53's core plays? Notorious's cash game options?Stlcards GPP pool? JMToWin's salary savers? Select that option and you'll see who they are focusing on. You can even select multiple filters if you want to see two or more of the experts filters in action. The experts will even provide some analysis on some of the players they have selected to give you more insight into their thought processes. Have you ever wanted to know what the experts are saying about a player without having to search the website or article to find it? Now with the LineupHQ you can do precisely that as there is a TAKES option that will tell you whenever a player has an Expert "Take" and by clicking on the number associated to the player you'll be able to have a pop-up window that brings up those takes for you. A big part of research for top DFS players is advanced metrics and with LineupHQ you'll have all those at the tip of your finger while you're building your lineups if you're a RotoGrinders Premium member. 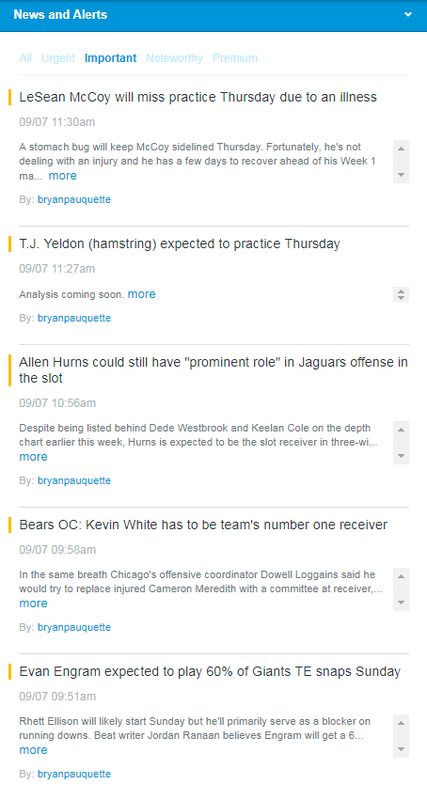 For NFL, you'll have access to important statistics and data from Football Outsiders and Player Profiler including things like DVOA, injury history, weather reports, and red zone usage. 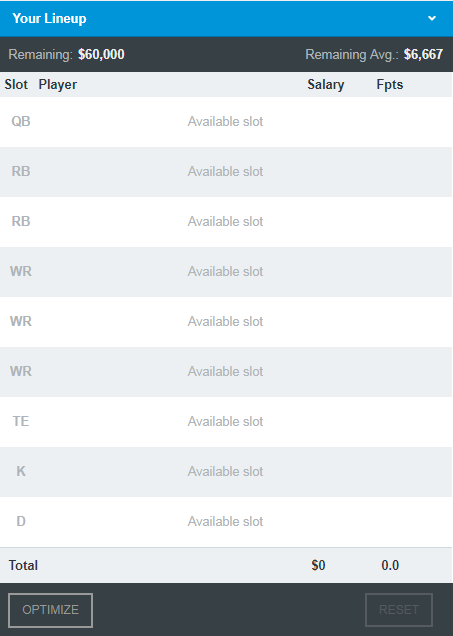 A big part for figuring out which receivers to utilize in your lineups is their match up and RotoGrinders is proud to introduce our own in-depth WR/CB match ups that will be available to all our Premium members right on your LineupHQ page. You'll get the likely CB they are facing up against and our Matchup Rating (the higher the number the better for your WR - for example, "(player-popup #larry-fitzgerald)Larry Fitzgerald":/players/larry-fitzgerald-12162 has the highest rating this week in his matchup against the Lions Quandre Diggs). You have all that great information available within your player pool pages but wait... there's more. The LineupHQ Dashboard (our unofficial name for it) at the bottom right of your LineupHQ page will give you access to all the great tools and resources we have available for you at RotoGrinders. 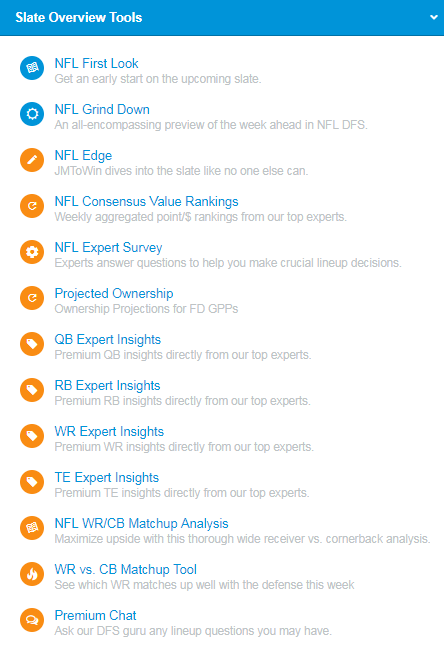 First there are the Slate Overview Tools where you can look at free features like the First Look and Grind Down or access Premium content like the Consensus Value Rankings or our new positional Expert Insights. 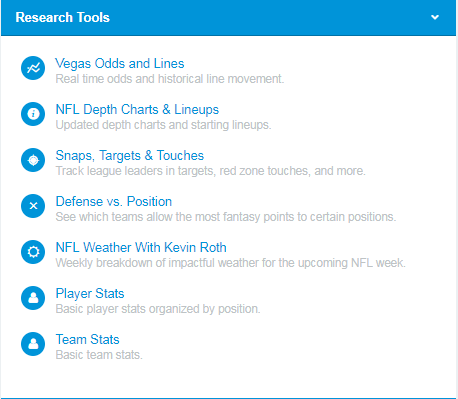 Research Tools will give you the ability to pull up free tools like Vegas Odds, Depth Charts, utilization, DvP, and the Kevin Roth weather report. There are tons of Grinders Live shows available each and every day and you can watch those now as they take place while building your lineups. 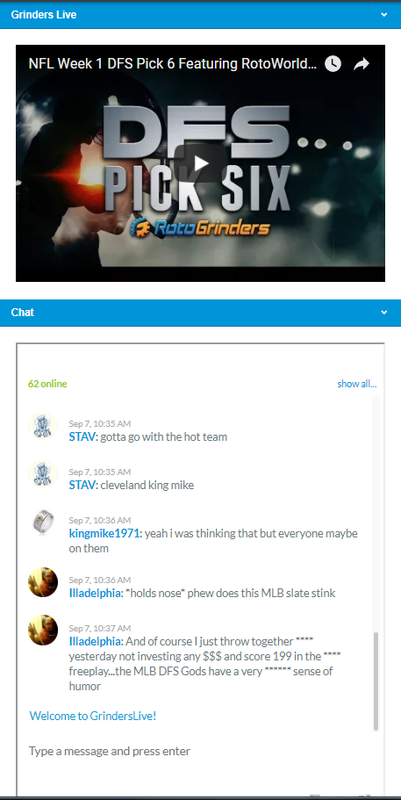 You can also see what the rest of the RotoGrinders community is talking about in the chat rooms. 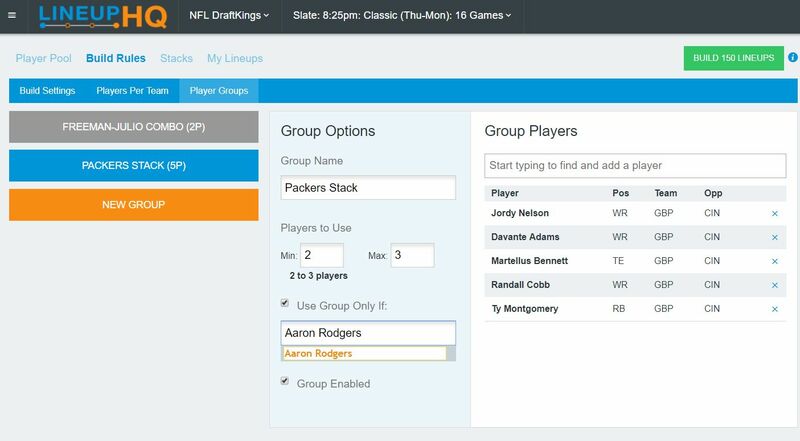 Stacking is a big part of building successful, winning GPP lineups and we have a new Stack Builder feature that will let you build multiple team stacks utilizing options you choose. Want to stack a QB with a WR from their team and the opposing team WR - you can do that here. Want to do a onslaught stack for a team? You can do that as well. Generate the number of different stacks you want and the Stack Builder will generate the top projected stacks based on the criteria you enter. You can then go through and save the ones that stand out for you and allocate percentages to those stacks for when you generate your lineups. 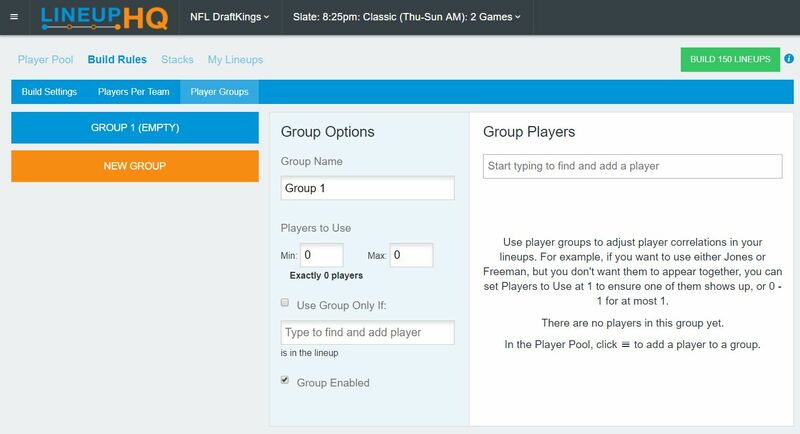 Groups provide you with functionality that will allow you include or exclude players based on definitions you assign based upon particular players. You can access Player Groups by clicking on the Build Rules link on LUHQ and then clicking on Player Groups. Let's look at a couple examples to give you a basic understanding of how they work. The default example explains how if you want to make sure you don't have "(player-popup #julio-jones)Julio Jones":/players/julio-jones-12896 and "(player-popup #devonta-freeman)Devonta Freeman":/players/devonta-freeman-18261 in the lineup at the same time you add these two players to the group and set the minimum to 0 and the maximum to 1. Here's a screenshot showing you how you would do this? Want to mega-stack the Packers and make sure anytime "(player-popup #aaron-rodgers)Aaron Rodgers":/players/aaron-rodgers-11601 is in the lineup that there are at least two other Packers in the lineup with him? The groups feature will allow you to do that. Set the minimum to 2 and the maximum to whatever the most Packers you want in the lineup to. In this example we're going to go with the onslaught stack and add all the key Packers skill position players. 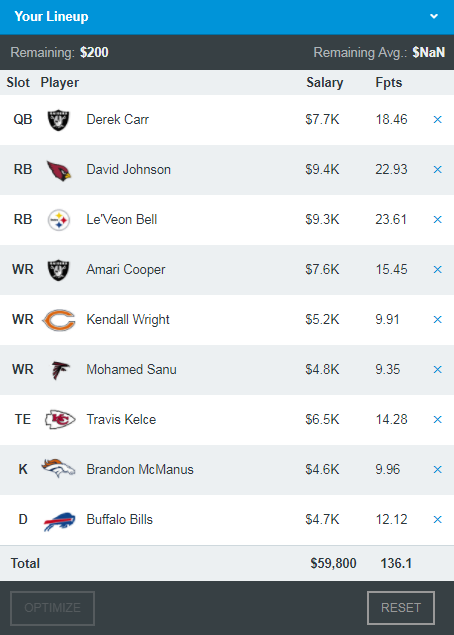 When you run LUHQ it'll then make sure anytime "(player-popup #aaron-rodgers)Aaron Rodgers":/players/aaron-rodgers-11601 is the QB that at least two of these players are in the lineup with him and will go up to a maximum of three (giving your lineup a total of four Packers). Access all of the LineupHQ Premium features today! Whew that's a lot. 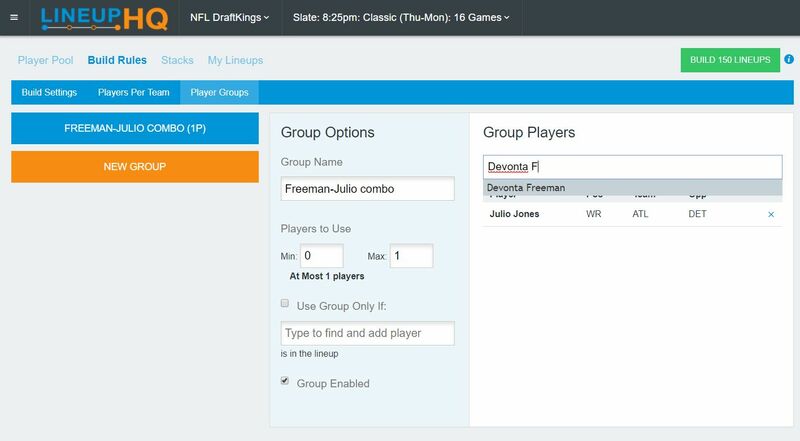 LineupHQ will be replacing our current lineup builder in its entirety soon and while much of it will still be free, there are many features that will be exclusive to our Premium members, including the Expert Insights, Premium Filters, Takes, advanced analytics from Football Outsiders and Player Profiler, and the Stacks Builder.